– Simple tips to manage consumption amounts effectively (eating and drinking mindfully). 1. Write down (or type)*, in as much detail as possible (record all senses—see, hear, feel, smell, touch—time of day, what you’re wearing, temperature…), what you DO remember. 2. Leave two to three lines between each documented line. When new memories emerge (it’s interesting how information just pops into one’s head when relaxed), add those thoughts to the document. 3. Keep all thoughts in chronological order to enhance memory. For tactile (hands-on) learners, writing or typing will appeal to your hands-on learning style as well. For visual learners, reading what is written will appeal to your hands-on learning style. Bolding information, adding color coding, and even pictures or emojis will encourage remembering. For more information on remembering through writing techniques, go to the Writing Sensorably (book) page. 1. You must have a strong, PERSONAL, reason why you want to stop smoking. a.) Do you want to smell better (not smell like cigarettes)? b.) Do you want to breathe easier? d.) From a mind over matter viewpoint, as well as physiological, triggers become anchors that encourage the habit of smoking: click here for a PDF on what that means and how to create healthy anchors. In addition to above-mentioned points, how much time would you save after cleaning yourself up after smoking? What would you do with that time? If you don’t know what you would do with that time, think about what you COULD do. Finding a strong reason to revise a habit like smoking (for health reasons, doesn’t seem to make a difference), will increase success. – getting enough sleep (when one sleeps, one heals). 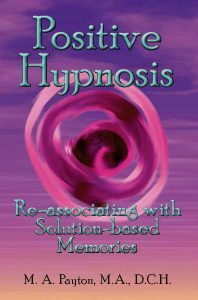 For more information on positive hypnosis techniques, go to the Positive Hypnosis (book) page and go to the “Education” section of this website for free training videos. – 40% of food consumption is satisfied when smelling and tasting your food more completely. – Physical fullness (the stomach) catches up with the brain after approximately 20 minutes. 1. Make a fist; this is, generally, the size of one’s stomach. 2. Before eating, put your fist next to your plate. Consider a way to plan how much you will eat in one sitting and how much you will pack away for leftovers. – Before taking a bite or drink of something, smell it. – Count in your head: 1, 2, 3. 4. Take that one bite or one drink. – Experience it: notice texture, actual taste… Finish one one bite/drink experience. – Before picking up a utensil or glass, count in your head: 1, 2, 3. 5. Check in with the body after consuming food/drink (maybe it’s 3-5 bites, 1/2 a plate of food or half glass of beverage… also see point 2). Fact: It can take up to 20 minutes for the brain to catch up with the physical body being truly full (if this link doesn’t work, google this for data). Are you eating at an experiential pace to know how you feel? For more information on other positive hypnosis techniques, go to the Positive Hypnosis (book) page and go to the “Education” section of this website for free training videos (notice, particularly, information on how the brain works).